UPDATE: Police say the woman is now officially wanted in a Mischief-Endanger Life investigation. And update of this story can be found here. 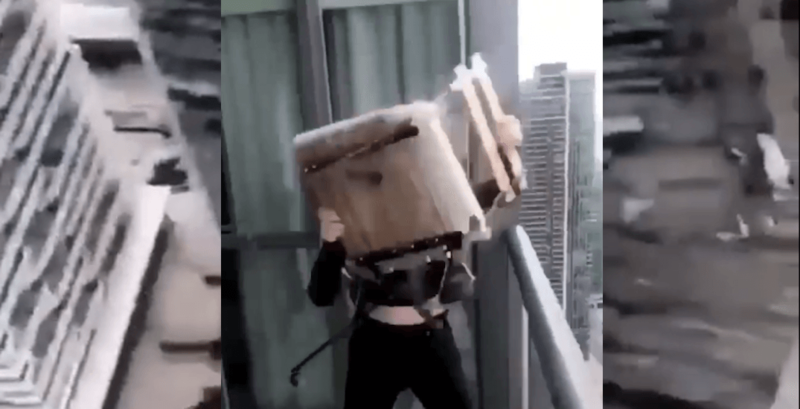 Toronto Police are investigating after a video surfaced on social media showing a woman throwing a chair off a Toronto condo building. The video, shared by an individual who doesn’t seem to be associated with the woman throwing the chair, shows the furniture piece slowly falling onto what appears to be the Gardiner Expressway. The short video, which has been seen almost 200,000 times on Facebook alone, ends before the chair lands on the highway. Toronto Police say they hope to have an update on the investigation later today. At this time, they have not identified the woman in the video, or said if there have been injuries as a result of the chair landing onto traffic.